“The traditional first anniversary gift is supposed to be paper, but you run a paper based company, so that’s’ a bust.” An excerpt from Mike’s homemade anniversary card to me. I’m great at making cards – in fact, it’s what I do when I’m not at my full time job. 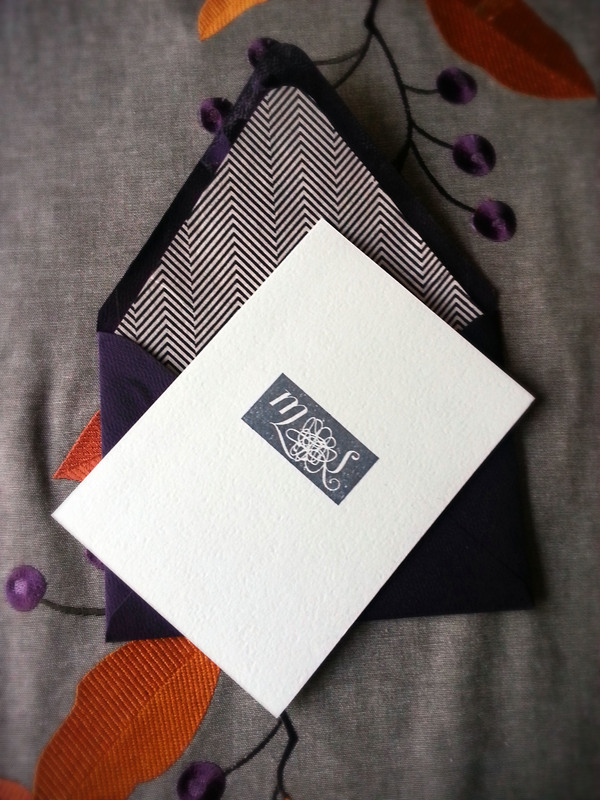 However, most of my cards are invitations, or blank on the inside in the case of my greeting cards. That’s because I’m not good at writing in cards. I never have been. You’re either going to get “Your Name, (printed message from store bought card), Happy (insert occasion here), Love Sydney” or a small novel. The witty one-liner is totally lost to me. So when I had it on my to-do list to make Mike a card and I found myself at Target in the card aisle (minor detour from grocery shopping) trying to figure out what one writes on an anniversary card, I found a card that made me chuckle and purchased it. Not only was it a cute card, but it inspired an elusive witty one-liner from me. But it wouldn’t be a card for Mike from me without a small novel – so I grabbed an aubergine colored note card from my office and wrote out a nice letter to him as well and tucked it inside the store-bought card. Towards the end of dinner I presented Mike with my card (I’ll detail dinner below, warning: you may want to grab a handkerchief now to wipe up the inevitable drool). He laughed at my witty one-liner and aww’ed at the kind words in my small novel, er, card insert and when we got home he gave me the card that he’d made for me. Yes, you read that right, he made my card. My husband, the sound tech, made his stationer wife a card – while she, the stationer, bought his card from Target (I swear it was a cute card that I picked out – I mean, the typography wasn’t anything to write home about… perhaps I should have bought a card at Paper Source while I was there… right before I went to Target). Anywho, before I even read what Mike had written inside the card I was touched by the thought that he put into making my card. I recognized the textured envelope instantly (it happened to be the matching aubergine envelope to the aubergine card that my note to Mike was written on) and upon opening it I noticed that he’d glued an envelope liner inside (taken from one of my Valentine’s Day cards). Instead of just using a white piece of paper for the card, he grabbed an off-white (matched the liner better) folding card and stamped it with my new charcoal chalk ink using our monogram stamp that he made me as a wedding present last year (the charcoal ink also matched the liner). I couldn’t have been more impressed. Until I saw that he’d also written a small novel inside the card. Anniversary win. We made reservations at my favorite splurge restaurant Mon Ami Gabi. When we go to a splurge restaurant, we go all out. There isn’t a course that we decline. So after selecting our bottle of Pinot Noir, while munching on the baguette at the table, we selected an appetizer. Our appetizer consisted of incredibly fresh tasting, thinly sliced, salmon, capers and creme freshe to put on top of toasted brioche. After that we each selected a soup. Mike went with French Onion that came in a large ramekin. I opted for the soup du jour, a creamed rutabaga with apples and creme freshe. Thankfully my soup was not the quantity that Mike’s was (this was a marathon meal, not a sprint, but I needed portion control to get through all of the courses without slipping into a food coma before the bill was paid). Next came the entrees. Mike got the plat du jour, pork tenderloin medallions wrapped in bacon. Tender doesn’t begin to describe just how perfectly the pork was prepared (I had a bite). Meanwhile, I ordered a trout with toasted almonds, lemon, and French green beans (another perfect portion). Instead of jumping right to dessert, we opted to have a cheese platter brought out. The platter was 3/3 with delicious cheeses accompanied by a seasonal fruit compote and raisin toast. We rounded out the evening with a cup of coffee for Mike and an order of Bananas Foster to share. I succeeded in holding off the inevitable food coma until we returned home and I passed out on the couch while we watched an episode of Last Man Standing together. All in all it was a wonderful evening – and the perfect way to cap off a great first year as a married couple. 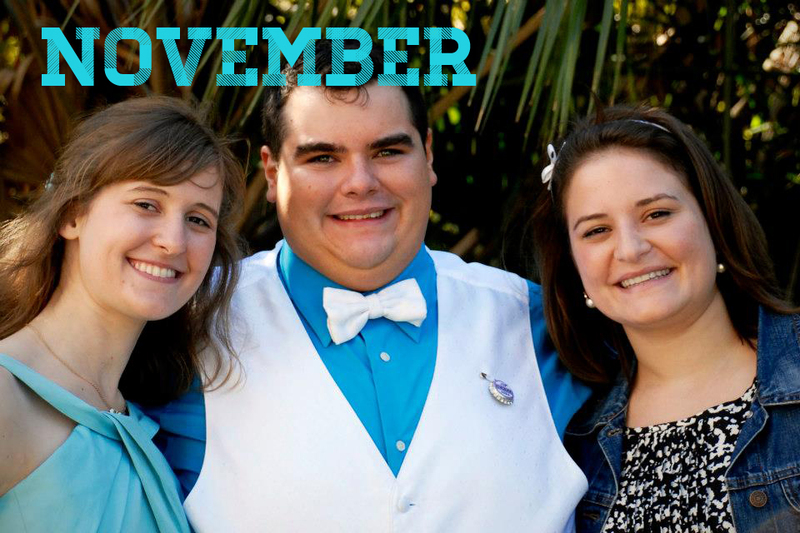 I cannot believe that the holidays have come and gone and that 2012 left with them. In the inevitable nostalgia of a new year, I’m paying one last homage to one of the greatest years of my life thus far: 2012. We’re almost to our first wedding anniversary! A year ago yesterday it was in the upper 40s low 50s and Mike and I were attending a friend’s wedding. It was a beautifully sunny day that didn’t require a winter coat, I remember keeping my fingers crossed that we’d be graced with equally fantastic weather. Consequently, we had our only major snow storm the night before the wedding, bathing the landscape in a sea of winter white. It ended up being a blessing in disguise (despite the flight cancellations that had to be worked through and the horrific roads trying to get from our house to the rehearsal dinner) as our photos looked stunning with all of the snow. And even though the temperatures were in the low 30s, while everyone else insisted that it was cold, I was nice and warm in my massive wedding dress – at times, a little too warm! The best day of January though was January 22nd. You might be thinking wait, I thought you got married on the 21st… Yes, I did – however the 22nd was the best day because the wedding was over (I loved every minute of the wedding day, don’t get me wrong) and I could sit and visit with all of my family and friends who had come into town for the wedding. I had breakfast with all of the guests who stayed over at the hotel (Mike slept in and joined more around brunchtime) and then we went over to my parent’s house to celebrate my brother’s 17th birthday with our extended family. It was perfect. 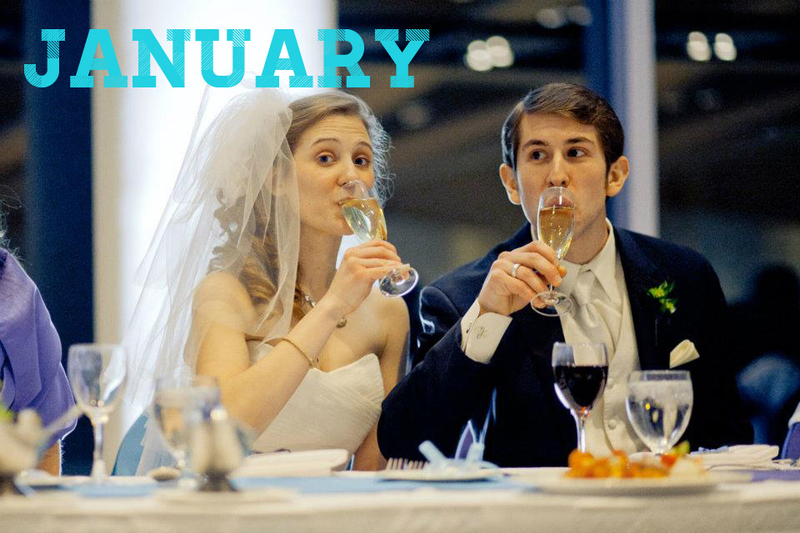 FEBRUARY: We wasted no time going from wedding mode into full on house searching mode. 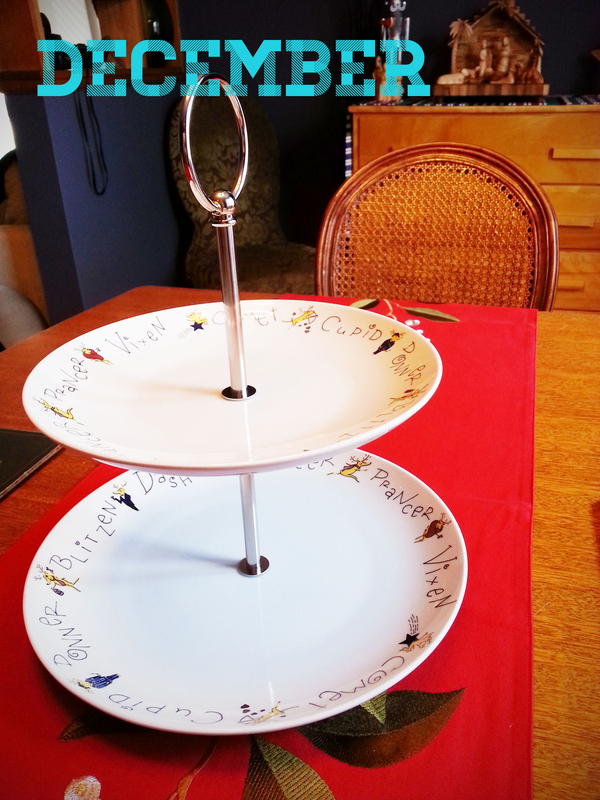 By February we were actively house hunting (although we didn’t expect to find something as quick as we did – which left us in a nail biting standoff with our landlord when we did finally find a house a few weeks later). Mike had to work the Austin Mahone concert on Valentine’s Day and made sure to bring me red roses that Austin left in his dressing room (who says romance is dead). We still have the red vase that they came in displayed in our living room! I thought it made for a great Valentine’s Day flower story. 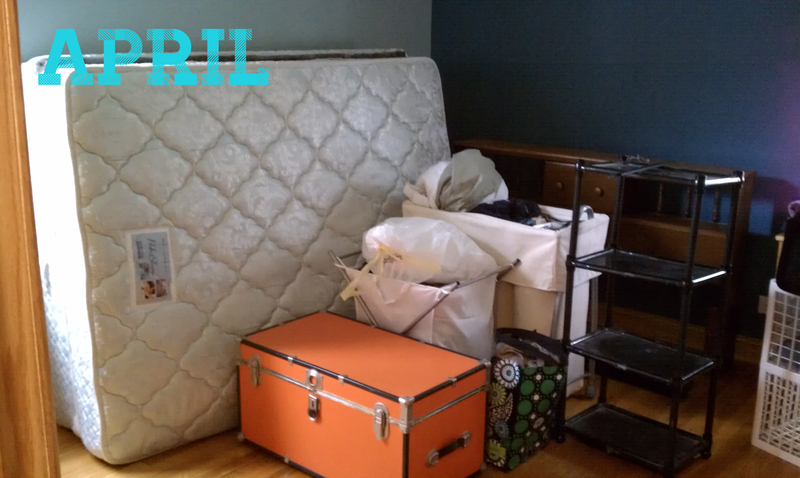 MARCH: I don’t remember much about March other than trying to play it cool while we waited to hear if the mortgage was officially approved or not. I feel like I spent most of April on the phone. Mike was working the run of a show, so there were lots of phone calls between me and Mortgage Lady Pam, me and Mike, me and the lawyer’s office, me and Flooring Man Ben. After two months of the house-buying process, we finally closed on April 16th! By the next day we already had Ben in the house taking care of the wood floors, followed by Paintapalooza that weekend. We were all moved in and out of the rented house on Wilson by the end of the month. I had a brief moment of nostalgia when we left the keys at the Wilson house – but it was really brief, because we really had moved on to bigger and better things. 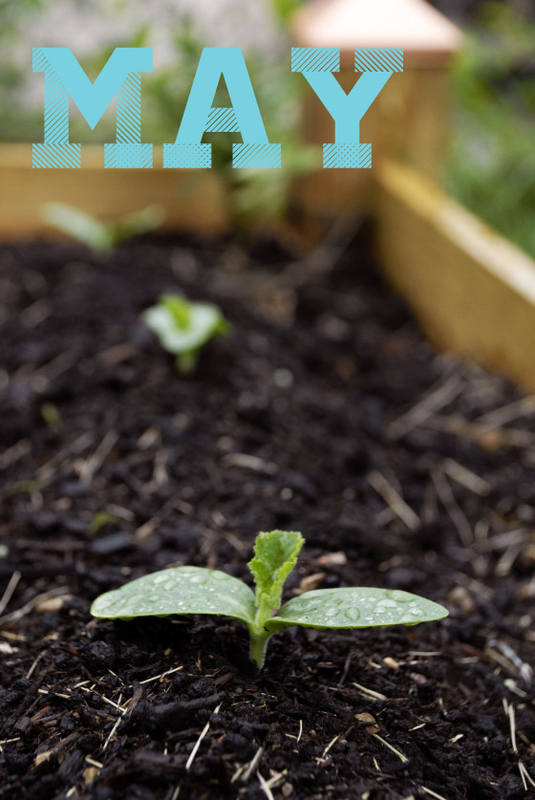 In May I set out to create my vegetable garden and tame the existing gardens around the house. Although a few vegetables were actually sorta produced, the summer that followed was brutal and most of the garden wilted away. As for the several weekends that I spent trying to clean up the existing gardens, they were long and tedious and pretty much for naught since most of the weeds rapidly grew back and I never actually got to 75% of the garden space. But in May, I was full of hope and a strong resolve to beautify our yard. 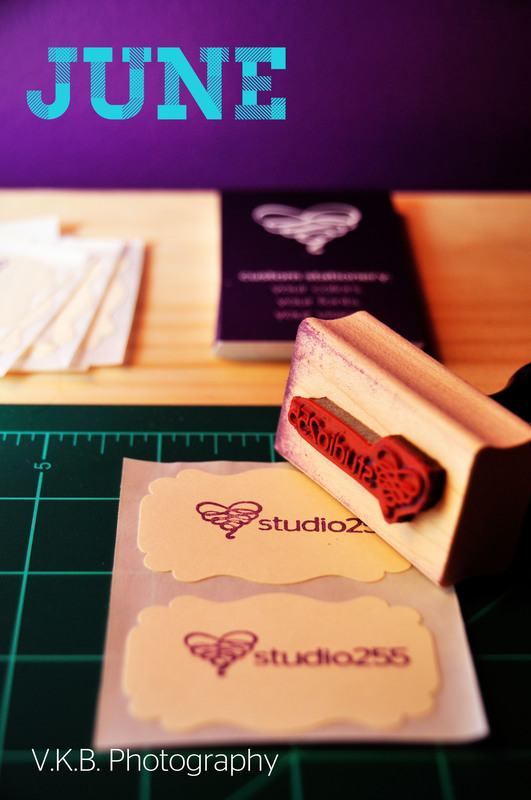 JUNE: By June I was ready to expand my company, Studio255, to the online marketplace Etsy. It was slow-going at first, I remember the first few dejected weeks of no sales. JULY/AUGUST: All that really sticks out about July and August was the unrelenting extreme heat. Mike and I consider ourselves fairly hearty individuals. Born and raised in the Chicagoland area, we can ride the temperature roller coaster weather with ease. Our initial plan upon moving into the house was only to turn the A/C on when the temps rose above the low 80s…well that turned out to be pretty much the whole summer. The awesome part of this hot summer was staying inside to watch the Olympics (I’m a huge Olympic nut). Since Mike and I don’t have live TV, I spent pretty much two solid weeks at my parent’s house, hanging out with my dad, watching the games. Mike popped over on occasion, though by week two his Olympic spirit was waining. Mike in the finishing stretch of the Tough Mudder, running through a muddy field of hay bales with live electrical wires hanging down. He assures me that this is fun…. During those months of extreme heat, Mike and some of his friends had been training for the Tough Mudder in September. Thankfully the weather wasn’t oppressive anymore, in fact, it was even a little chilly the day of the event. I tagged along on the trip (it was in Wisconsin) to take photos. Everyone had a great time and the team had a solid performance. 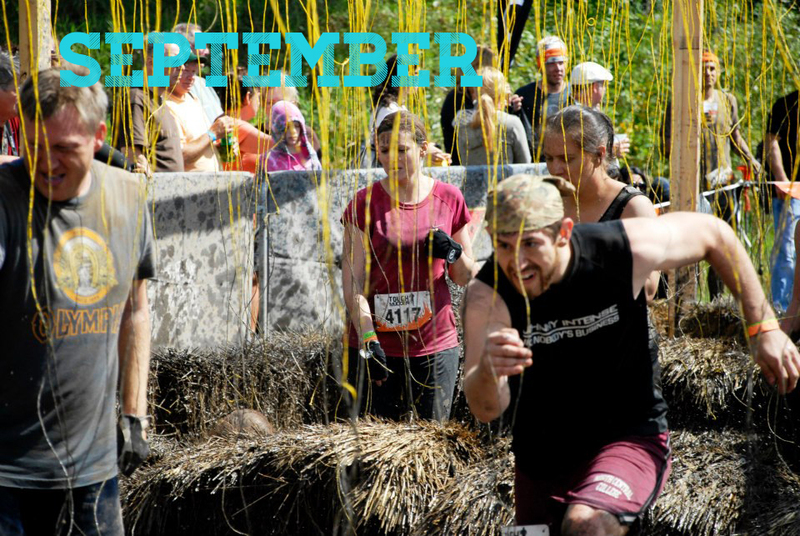 Mike has since been making plans for his 2013 obstacle races – he’s hoping to include another one or two Tough Mudders and it sounds like he might be recruited to join some fellow theater folk in doing a Spartan Dash. 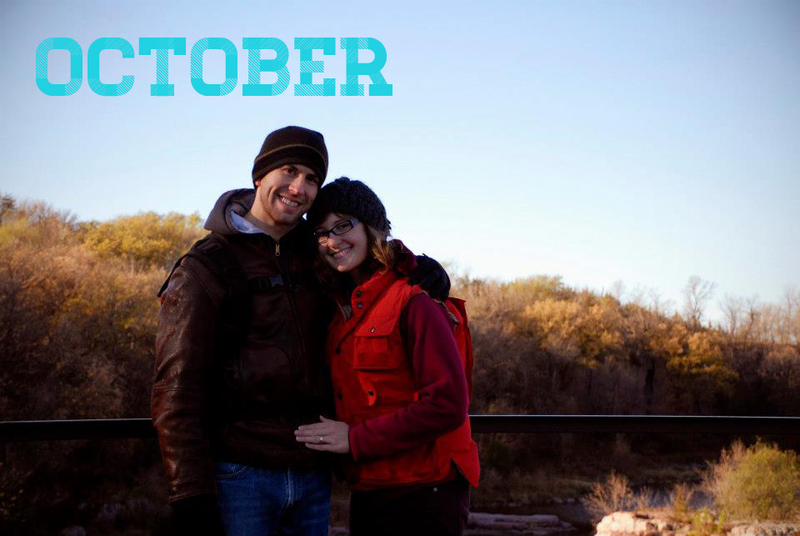 The highlight hands down of October was our honeymoon to South Dakota. We cannot speak highly enough of that trip. It was an 8 day road trip that included about 25 miles of hiking, 2600+ miles of driving, visiting the Badlands, Custer State Park, Palisades State Park, Mount Rushmore, Crazyhorse, the Effigy Mounds and many local hole-in-the-wall restaurants along the way. We’re hoping to plan more road trips in our future in hopes of seeing more of the United States. I didn’t see Mike most of the month of November. He was brought on to the A1 spot for the musical Annie at the Paramount and put in long hours getting ready for that show. The production was fantastic – even the press agreed, rating it better than the production currently on Broadway (in NY I believe). I went to see opening night a few hours after returning home from a Thanksgiving-week trip to Florida with my sister for one of my best friend’s weddings. Tory and I had a blast celebrating at Disney and then getting to spend Thanksgiving with our extended family from Florida. I did miss Mike on Thanksgiving though, it was his one day off from tech rehearsals and it would have been nice to celebrate our first married Thanksgiving together. My ‘free time’ in pretty much all of November and December became about running to catch up with my exploding Etsy store. I knew there would be a little holiday bump, I wasn’t expecting (and was very pleasantly surprised with) the incredible amount of orders that came through (189 to be exact!). In addition to all of the sales, my Etsy also found its way onto some blogs, which drove even more traffic to my shop. After a brief reprieve in sales volume in the days surrounding Christmas, the shop is back to selling the same volume it had been during the holiday bump (I guess that doesn’t make it a bump anymore?). Thankfully, I’ve come up with new solutions to help keep the orders moving through my shop smoothly and with less headaches. The one downside to all of the Etsy work though was that I feel like I missed getting involved in Christmas. It didn’t help that I actually got sick a few days prior to Christmas – which ended up landing me at home in bed in a little number I like to call, Quarantined for Christmas. Thankfully, and inexplicably, Mike never caught either of my bugs (strep AND a viral post nasal drip). Mark that holiday number 3 of 2012 that we didn’t get to spend together (we did spend some time together Christmas day, but I definitely missed Christmas Eve) and then count New Years Eve as holiday number 4. I’ve been noticing that my weekends have become extensions of my work-week. They pretty much consist of long days in front of the computer freelancing (it’s the start of wedding season for vendors…). This means I really haven’t had time to do some of the things that I find important and enjoyable: correspondence, crafting, seeing people… so I’ve decided to [try] committing one weekend a month to only two hours of Etsy work and no wedding stationery work. Let’s see how long that lasts. I really hope that Mike and I can celebrate more of the holidays together this year. I know he’ll be working on Valentine’s Day and we already have plans to celebrate our anniversary together (thankfully he has off work that evening so we can go out to dinner). There are definitely some home-related projects that I’d like to find time to tackle. Year two of the yard, staining some furniture and organizing the basement to name a few things. Thanks for reading in 2012 and hopefully I’ll have plenty of interesting stories to regale my readers with in 2013!